A pedestrian walks past the storefront of a Blockbuster Video in South Orange, New Jersey, Nov. 11, 2004. It's another nail in the coffin of physical media. Dish Network Corp., which acquired Blockbuster in 2011, has now announced that it will close approximately 300 Blockbuster stores in the coming weeks, leaving just 500 U.S. locations still open. "We continue to see value in the Blockbuster brand and we will continue to analyze store level profitability and -- as we have in the past -- close unprofitable stores," John Hall, a spokesperson at Dish, told ABC News. "Some of the approximately 300 stores are reaching the end of their lease and others are closing based on overall performance." Over 3,000 Blockbuster employees will be laid off as a result of the store closings. 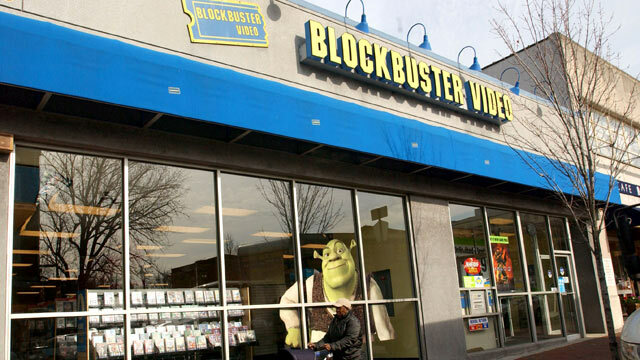 Blockbuster began shutting down some of its stores as early as 2009, losing customers to Netflix's DVD-by-mail service and other online video streaming services, such as iTunes. In 2012, Blockbuster began offering DVD-by-mail services and video streaming on its website. However, in an interview with Bloomberg in October 2012, Dish CEO Charlie Bergen said the company would abandon its plans to compete head-to-head with Netflix. "Dish no longer has plans to use Blockbuster as a nationwide video streaming or DVD-by-mail service, Ergen said," according to Bloomberg. Blockbuster still offers the video service and the DVD-by-mail service. Hall confirmed to ABC News that the store closings would not affect Blockbuster's other products and services. The closings and the decreased use of the DVD-by-mail services are part of a major shift away from physical media. With more TVs being sold with built-in Internet streaming services, including Netflix, Hulu, etc., and TV boxes like the Apple TV and Roku being sold for only $100, the idea of putting a disc into a player is slowly fading. "Much like record stores, the video rental store is another victim of the Internet. Ubiquitous and fast broadband, combined with the rise of rental services such as iTunes made this inevitable," Michael Gartenberg, Gartner Research Director, told ABC News. "Online services offer greater catalogs, no 'out of new release' signs and, of course, no membership or late fees. An entire generation will soon view physical media for entertainment as quaint as a landline rotary telephone." +Want a 110-Inch Ultra HDTV?